A traditional ruler in Osun State, the Oloni of Eti-Oni, Oba Dokun Thompson, at the weekend used the Holy Bible to pacify the Land, warning that poverty would persist unless the Land was appeased. Speaking at the first Cocoa Festival in Africa, the monarch explained that there may have been a curse on the land, following the manner a renowned Yoruba king, Oba Emmanuel Olajide Layode, Soun of Ogbomoso, was killed mercilessly in 1969 during the Agbekoya revolt. The revolt had occurred following the hike in taxation on cocoa. production in Nigeria was wallowing in abject poverty like many other communities in the country despite having a land of richness. The monarch noted that the wealth from Cocoa did not manifest in the cocoa producing communities and the people because of the curse. Oba Thompson prayed for an appeasement of the land so that late Oba Layode’s soul may finally rest in peace and for a renaissance of the wealth created in the western region from cocoa in the 60s. 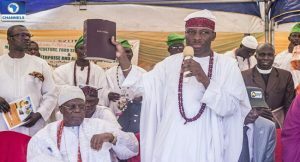 During the cocoa festival, which was tagged ‘Gureje Day’, Oba Thompson raised the Bible that was presented to him by the Christian community in Eti-Oni and showered blessings on the community and the nation. “This Cocoa Festival was meant to mark the 120 years of cocoa production in Nigeria as pioneered by Eti-Oni. But you would be wondering that this wealthy community was languishing in abject poverty over the years. “There would be wealth on the land and poverty would vanish when we appease the Land. That was why I sought the intervention of the King of kings who created the Heavens and the Earth,” Oba Thompson said. The Osile Oke-Ona Egba, Oba Adedapo Tejuoso, who was Royal Guest of Honour on the occasion joined his host, Oba Thompson in appeasing the Land and pouring blessings upon Land through the Scriptures. Speaking on the occasion, Osun State Governor, Mr Rauf Aregbesola, reiterated the need to go back to farming as the panacea to the current economic situation caused by dwindling oil revenue. The governor lauded Oba Thompson for his pragmatic approach in redirecting the attention of the people to profitable cocoa production that would bring maximum gain to the farmers and change the fortune of the people. Aregbesola, who was represented by the Coordinating Director in the Osun State Ministry of Agriculture, Food Processing and Youth Engagement, Dr. Isaac Aluko promised full support for any initiative geared towards agribusiness.